This great Lake Front home is a wonderful place to spend time with your family and friends. The house has an open floor plan with a wall of south facing windows offering wonderful views of the large deck, the big front yard, the lake and beautiful sunrises. The living area has a lot of comfortable furniture, TV with direct TV and a 200 disk CD player with an eclectic mix of about 150 CDs and both indoor and outdoor speakers. The kitchen has new appliances, plenty of counter space and is equipped with a very large variety of pots and pans, dishes, cookware, BBQ gadgets, utensils and so much more. The master bedroom has a deluxe king size pillow top bed. The second bedroom has two full size beds. Part of the garage is set up as a detached dorm room with twin bunk beds, a twin bed and kid friendly furniture, this makes a great place for kids to hang out. The yard has 102 feet of lake frontage and a seasonal dock (March to mid July) for parking your boat and other water toys. So much to do! : Pine Hollow reservoir offers a lot of recreational activities. There is great fishing in the reservoir we called it catching because it was a rare day we didn't bring in at least a trout or two and usually a whole stringer full. Fishing is allowed on the lake year round and the lake is kept well stocked. In the summer from July 1st to Labor Day the speed limit is lifted and it is time to pull out the wave runners, skis, wake boards and tubes and as my husband said troll the kids around the lake. If you don't have your own toys, fishing boats and a party barge are available for rent at the nearby Pine Hollow Lakeside Resort. If you enjoy hiking or biking the Mt Hood National forest is just a few miles away. Historical places nearby include Shaniko and the Barlow trail. 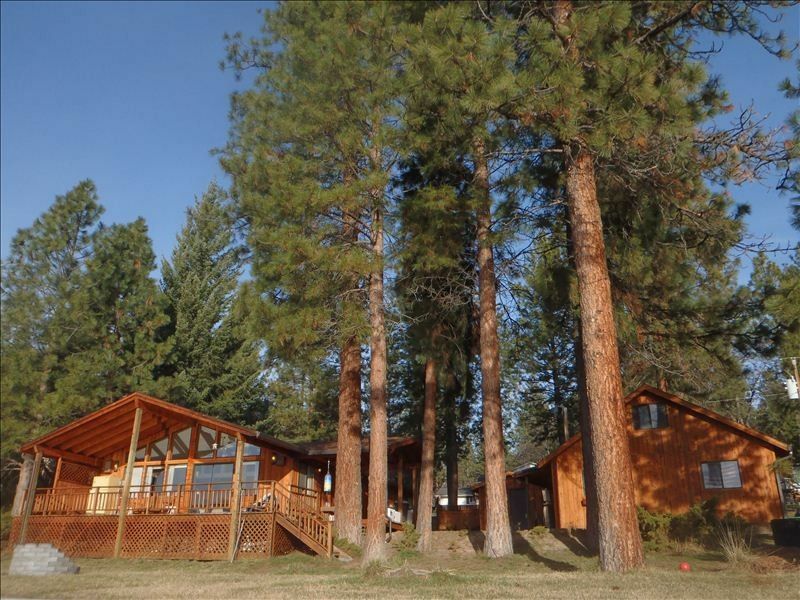 The house is just a 20 minute drive to Maupin for great white water rafting on the Deschutes River. Just bring your food, clothes and toys: Our home has everything you will need for a great weekend getaway or a longer vacation retreat. When we moved from Pine Hollow to the Caribbean, we had to leave everything behind, so the house is extremely well stocked. My husband is a BBQ enthusiast and I enjoyed baking, so you will find specialty equipment and a lot of supplies on hand. We also did a lot of entertaining so the house is equipped with large serving platters and bowls and plenty of glasses including wine glasses, margarita glasses, shot glasses and plastic outdoor glasses. Also available for our guests use are air mattresses, life jackets and four lounge chairs for enjoying the sun in the yard or floating on the lake. Perfect Place to Make Memories: My family and I, spent almost every weekend and school break at The Lake House. We have a lot of fun memories of times spent with family and friends. Every year we had Memorial Day weekend and 4th of July barbecues, and a girls only weekend every June, when the girls and I would lay in the sun all day drinking blender drinks and then spend the evenings playing games and eating chocolate. At Christmas we would head out to the National Forest in search of the perfect Christmas Tree to fit the 12 foot vaulted ceiling and spend the days baking everyone's favorite Christmas treats which filled the house with the wonderful smells of a fresh cut tree and cookies. My husband and I are currently fulfilling a life long dream to live in the Caribbean. We moved to Rincon, Puerto Rico in March of 2011. I am very biased about this home. I love everything about it, some of my best memories took place here. The open living area and kitchen made entertaining family and friends easy and fun. Nature and endless views right out your front window. Wake up to a beautiful sunrise, watch the deer and geese walking by and through the yard, see the eagles and osprey out fishing, and know when the fish are biting. It is all happens right in front of the house. Pine Hollow is a reservoir. The water is right up to the yard in March, April, May and June, but during July, August and September we lose about a foot of water per day. In wall box unit and ceiling fans. Open living area with plenty of seating areas. We had such a great time here and we had everything we needed to have a great time. It is a comfortable home and a new location, right on the lake. Our older boys loved that they got their own little detached room to sleep in. All in all just a great place and a nice owner. Clean, spacious vacation property overlooking a lake, with views of Mt. Hood as you walk around the lake. Stocked kitchen with all the equipment you need. Excellent communication from owner and property manager. Would definitely stay here again. Clean well kept with beautiful views! Dawn your house is great and is in really good shape for a vacation home. However I am not sure who maintains the property but when we arrived we found the fire pit to be full of cigarette butts, baby wipes in the yard and the paddle boat and canoe had beer bottles in them. The water line was more then a 100yds from the house, we made the most of it and carried the paddle boat to the water so the kids could use it. The paddle boat steering handle was missing the bolt that connects it to the rudder and I semi repaired it with a screw and some tape so the kids could at least use it. Steve told us it was ok to use the paddle boat that was at the park and when the kids used that one the neighbor came down at 11 in the morning and was yelling at our kids about using her boat. Had we known it was not a community boat we would not have used it. Outside of those issues we went rafting locally as well as lawn mower races and made the most of the water that was left in the resvoir. Thank you for the review, I will be sure to address your concerns with our care taker. I just found out the reservoir was drawn out farther than normal this year because of plans to repair both the north and south shore boat ramps. In a normal year the water is about 200 feet from the property line in early September. Steve normally has the house and yard completely cleaned up and ready for visitors. I believe he had some personal issues and got his dates confused, he was not expecting you until the next day. I am very sorry your children were yelled at that is never a pleasant experience and upsetting for everyone involved. Great vacation home for the family. It had something for everyone, kids and adults. Great place to stay. Enough room for my whole family. It was great to have all the ammeneties provided. It was great to have coffee on the deck. Very relaxing. The care taker was also very helpful. Our home is located about 2 hours from Portland, 40 minutes south of The Dalles and 20 minutes north of Maupin. Here you can enjoy the great weather of central Oregon. Pine Hollow is in a rain shadow, meaning the rain clouds coming from the west are broken up by Mt. Hood and don't reform until after they have passed over our area. Pine Hollow has less rainy and cloudy days than on the west side of the cascades and is normally 10 degrees warmer than Portland in the summer months. Other Activities: The house is only 20 minutes from Maupin, where there are a number of white water raft companies offering fun 1/2 day and all day trips down the Deschutes River. The Wasco County Fair in Tygh Valley is held on the third weekend in August. This is a great little county fair with rodeo events Friday and Saturday nights and a demolition derby Sunday morning and afternoon. Golf: Pine Hollow Golf Course is open seasonally. This is a fun little 9 hole course with carts available. Ski: About a 45 minute drive to Government Camp.